Ben Ling created a new Samsung concept phone, the Galaxy Y II, shown below. We’re dealing here with a lower end smartphone, one that features a 3.2 inch touchscreen with Corning Gorilla Glass protection. The device has the TouchWiz 4.0 interface applied on top of Android and multitouch support for up to 4 fingers. 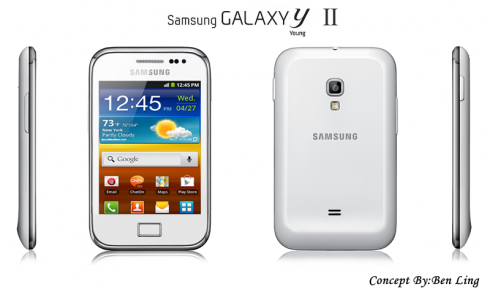 Samsung Galaxy Y II offers 275 ppi pixel density and a dual core 1 GHz Cortex A9 processor, plus a 3.2 megapixel camera with LED flash. The camera does 16x digital zoom and 480p video recording and it’s accompanied by a front 0.3 megapixel camera for videocalls. This model somehow runs Android 4.1 Jelly Bean and it comes with a Li-Ion 1500 mAh battery, plus 8 GB of storage, 512 MB of RAM and NFC.